In WordPress, navigate to Plugins > Add New. Search for “Backup by Supsystic” and click install. When the installation has completed click “Activate Plugin”. You will have a new admin menu item titled “Backup by Supsystic”. In your personal account on the supsystic.com, you will find a unique download link after purchase. After downloading the file (supsystic_backup_pro.zip), navigate to Plugins > Add New > Upload and upload the file. When the installation has completed, click “Activate Plugin”. 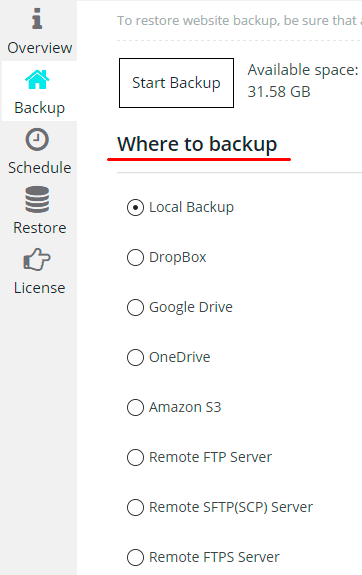 Go to the Backup by Supsystic in WordPress navigation menu. Remote FTP, SFTP(SCP) or FTPS Server. Learn more about how to work with storages and other backup parameters here. Also you can specify the Secret key for DB that will be required when restoring data from a database backup. This will help to protect your data from illegal use. You can select several items at one time. 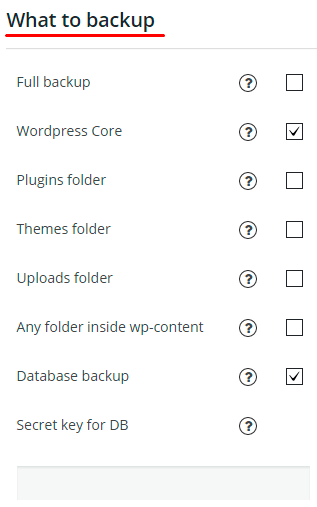 If you choose a full backup – all checkboxes will be automatically activated (including the database backup for wordpress site). Exclude files and folders from the backup. Enable email notification – activate checkbox and enter the email address where you want to be notified about how did the backup process passed. If Use relative path checkbox has been set up, the path will be set against in the root directory, where the WordPress is installed. If Use relative path checkbox has been off, the full path to the disk root should be specified in the Warehouse field. 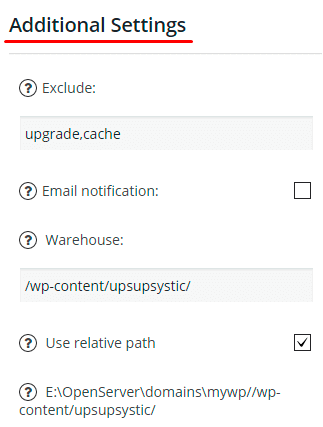 If the checkbox has been set up, then the backup path must be specified in the Warehouse field against the root directory, where the WordPress is installed. If the checkbox has been off, then the backup path must be specified in the Warehouse field against the disk root. After you have selected the cloud storage and have specified all the settings, click Start Backup. Wait while your site is being backed up. It can take some time if your website is large. It depends on your site and hosting, how long the process will take. 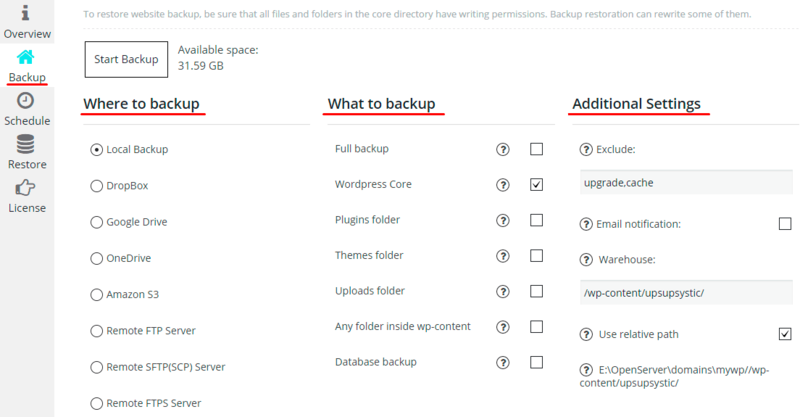 While WordPress plugin is backing up your website, you are not able to create another backup. When you see the message “Backup complete”, you can check the folder with backup. There you should see the archive with backup, log file and .sql file (sql file will be created only if you set the database backup). All these files will be with the same ID in the name. On Restore tab will appear a new entry with Database (if you marked Full Backup or Database Backup) and Filesystem backup files. On the top the following data will be shown: where backup has been made, the ID of backup files, the date and time of the backup. You can restore, download (only if it was backup to FTP server) or delete backup, simply click on the appropriate button. 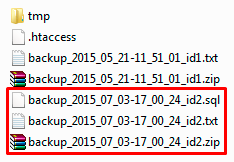 Also here you can view the log file of backup – just clicking Show Backup Log. In order to restore backup of your site you need to go to the Restore tab, select the backup files you want and click Restore button. When you see the message “Done!” – restoration will be completed. To read more information about Restoration click here. 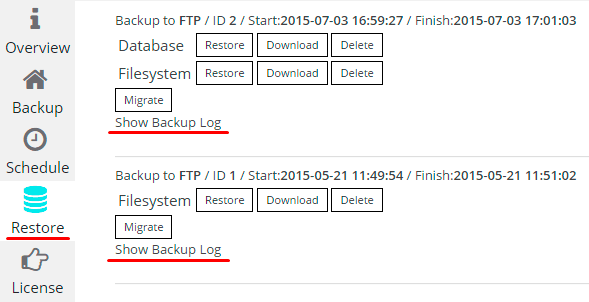 What is default location of FTP Backup by Supsystic Backup? How to get Access Key ID and Secret Access Key of Amazon S3 account?